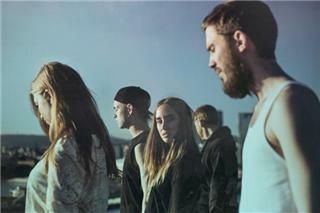 Its been 6 months since Highasakite released their first EP on Propeller Recordings to international acclaim. It was an EP that had it all, the hit single, the unique soundscape, the distinctive lead vocal, and the sometime surrealistic lyrics. Since than, Highasakite has kept busy. In between tours and numerous summer festivals, the band has found time to record their long awaited international debut album, due out in February 2014. The first single from the album, Since Last Wednesday will be released worldwide on September 20. While their earlier songs were inspired by childhood and nostalgia, the theme of the new album centers on the undercurrent thats going on behind closed doors, the silent battles at home, and the longing to get away. It introduces a darker side Ingrid to Helene Hviks lyrics, but fans of her surrealistic, and often innovative, views of the world wont have to worry. Its all there. Few bands manage to be so accessible and yet so complex and experimental. Highasakite is a master of balancing the sweet with the bitter. They have the musical skills to keep it interesting, the melodic hocks to make it memorable, and the pop sensibility to make it enjoyable. The last year has seen the band travelling around the western hemisphere. After having toured around Europe and the US, visiting Berlin Music Week, Iceland Airwaves, Eurosonic, SXSW, The Great Escape, Tallinn Music Week, Reeperbahn Festival, Roskilde, the SPOT festival and many more, the band is now ready to take on new challenges. The band is an intriguing proposition, matching blissful indie pop with electronic inflections to a rare sense of fantasy.